Stylish brown faux leather upholstered bed frame with a modern design. Detailed stitching on the headboard adds to the appeal. The sprung slatted base of this bed frame prolongs the life of your mattress. 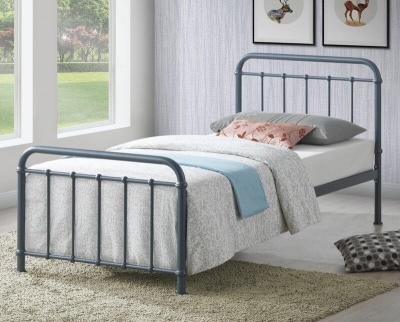 A great choice of bed for spare bedrooms and teenagers. Constructed with a robust hardwood frame. Bottom of side rail to floor - 11 cm. Fits a standard UK single 90 x 190cm mattress available separately. Part of our collection of single bed frames.